Since I’ve had no success in amplifying any of the Ireland Clam RLO (S/6/14 #19) DNA, I’m testing all the universal primer sets I’ve previously tried on the Ireland Clam DNA with red abalone DNA known to have heavy withering syndrome infection (confirmed via histology and qPCR) to verify that these universal primer sets actually work. I’m also using the withering syndrome primer sets on this DNA to function as a positive control. Nothing. Since there’s nothing, I didn’t bother labelling the gel. So, this suggests that the PCR reactions aren’t working. Will get newer reagents to replace the 5yr+ old reagents I have been using. Also will try a different thermal cycler, just to rule out all possibilities. The areas NOT demarcated by the black lines should all appear as dark blue (i.e. no fluorescence detected). I’ve never seen a plate look like this before. To be sure that the issue wasn’t specific to just the plate I was using, I ran an empty plate through the same Tecan method. Ideally, these should all be the same exact color (dark blue), since there should be no fluorescence in any wells. It dawned on me that the qPCRs I ran on 20140909 comparing different stocks of primers, using the new IDT probe (which all ended up looking bad), all used primer stocks that had been reconstituted with low TE buffer made in the lab, as opposed to “store bought.” Could this actually be the reason that the IDT probes (which come lyophilized and require reconstitution prior to use) don’t seem to work, while the ABI probe (which comes as a liquid, 100uM stock) does? Received new IDT primer stocks of WSN1F/R and reconstituted them with the store bought low TE buffer from IDT. Baseline Threshold set to 580 RFUs, as previously determined by Lisa for use with the Promega master mix. I’ll be damned! Our lab-made low TE buffer seems to have been the culprit! Both IDT and ABI probes performed perfectly and are virtually identical. 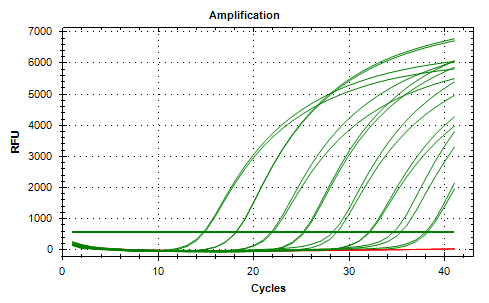 See the amplification plots and standard curve plots below for each of the two probes. Both exhibit R^2 values of 0.999. Due to poor performance seen in yesterday’s second run, which used the IDT probe instead of the ABI probe, I will run the p18RK7 curve (from 20120731) with both the IDT and the ABI RLP_p probes to see if the probe is the underlying issue. Baseline threshold set to 580 RFUs. Quick summary: IDT probe is bad, ABI probe is good. However, I’ve just realized that there might be more to this than just a bad probe from IDT. The amplification profile is suspiciously similar to what we were seeing with the bad probe(s) from Biosearch Technologies. The only thing that differentiates the IDT and Biosearch Technologies probes from the ABI probe is that the ABI probe already arrived reconstituted at 100uM. Biosearch Technologies and IDT probes arrive lyophilized and have to be reconstituted by us. Is it possible that the buffer we’re using is degrading the probes? Will order new IDT probe and order IDT’s version of low TE buffer (called IDTE). 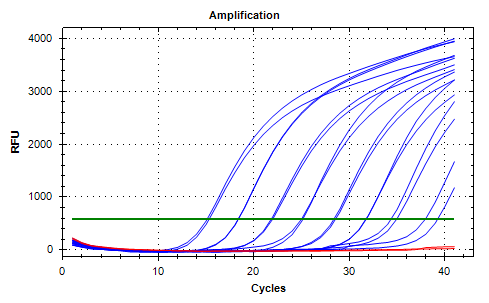 Quick withering syndrome qPCR assay test using the ABI RLP_p probe and IDT primers. This is to see if we can still use IDT primers that have NOT been ABI HPLC purified. This would be a significant cost savings, as HPLC purified primers from ABI cost ~$60 each (“regular” IDT primers only cost ~$6 each). This should work. Used p18RK7 curve from 20120730 because we are running low on the p16RK7 curve (from the same date). Plate layout, cycling params, etc can be found in the qPCR Report in the Results below. Not surprising,the IDT primers work just fine. Will continue to use/order IDT primers for withering syndrome PCRs. Ran qPCRs testing the “old” primers/probe (IDT primers, Biosearch Technologies Probe) using ABI 2x qPCR master mix and Promega 2x qPCR master mix. The curve used was the p16RK7 from 20120731. This was used because it worked perfectly on 20140418. Plate layout, cycling params, etc. can be found in the qPCR Report in the Results below. NOTE: Since this used a different polymerase (ABI) than what has been used in the past for this assay (Bioline), I did NOT adjust the baseline threshold. A new baseline threshold will have to be decided upon. The qPCR run with the new probe/primer set worked wonderfully! The qPCRs with the old primer/probes failed miserably! 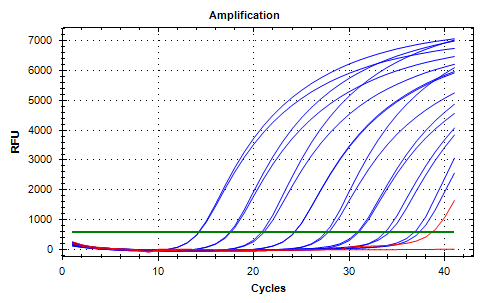 Here are the amplification curves and standard curve graph from the new primer/probe sets using the ABI master mix. 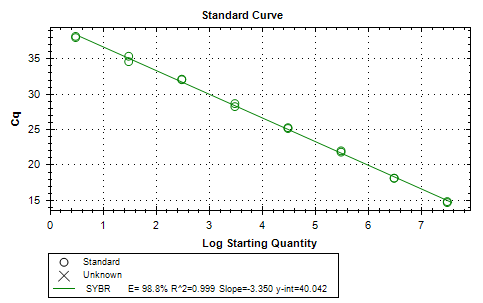 The brown colored curves are the standard curve. The blue colored curves are some of Lisa’s samples. 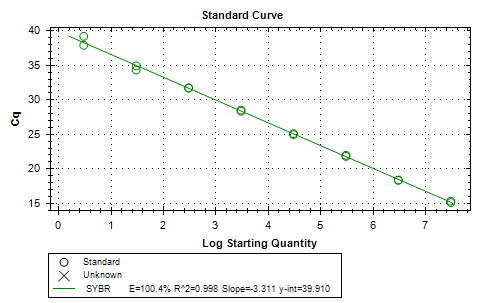 Below are the other TWO curves (yep, both of them!) run with the old primer/probe set. Purple colored curves are Promega master mix, green colored curves are ABI master mix.